plan for a smooth exit or succession today. All business owners will one day exit their business, either voluntarily or involuntarily; being prepared just makes sense. If exiting is in your short term plans, there are steps you can take to enhance the value of your business and make the process smooth and rewarding. And even if you have no specific exit plans, the steps to enhance business value also make great sense for optimizing performance, and will ensure you are ready in case unforeseen circumstances expedite your exit. Once you have your VEER assessment in hand, you will know exactly what needs to be accomplished to ensure your business is “exit ready”, and to maximize its value in the eyes of potential purchasers. Your A-R Partners Exit Planning professional will continue to work with you, through a series of monthly or quarterly meetings, to ensure that actions are completed, that the plan is updated with any new information or changing circumstances, and that new actions are identified and assigned. Exit planning is a process, not an event. And when the time comes that you are ready to “pull the trigger”, we will be right beside you throughout the whole process. According to a survey by PriceWaterhouse Coopers, 12 months after selling, 75% of business owners surveyed “profoundly regretted” the decision to sell. According to CIBC “In Focus”, “close to 60% of business owners aged 55 to 64 have yet to start discussing their exit plans with their family or business partners”. According to the Family Firm Institute, only 30% of family-owned businesses survive into the second generation. According to the Exit Planning Institute’s 2013 State of Owner Readiness Survey, 2/3 of business owners are not familiar with all their exit options, and 49% of have done no exit planning at all. If you anticipate exiting your business in the next five to ten years, contact us for a free, no obligation consultation. Bob has about 30 years of experience in accounting and business management, both in public practice accounting with Ernst & Young, and as either CFO or President of a variety of businesses. 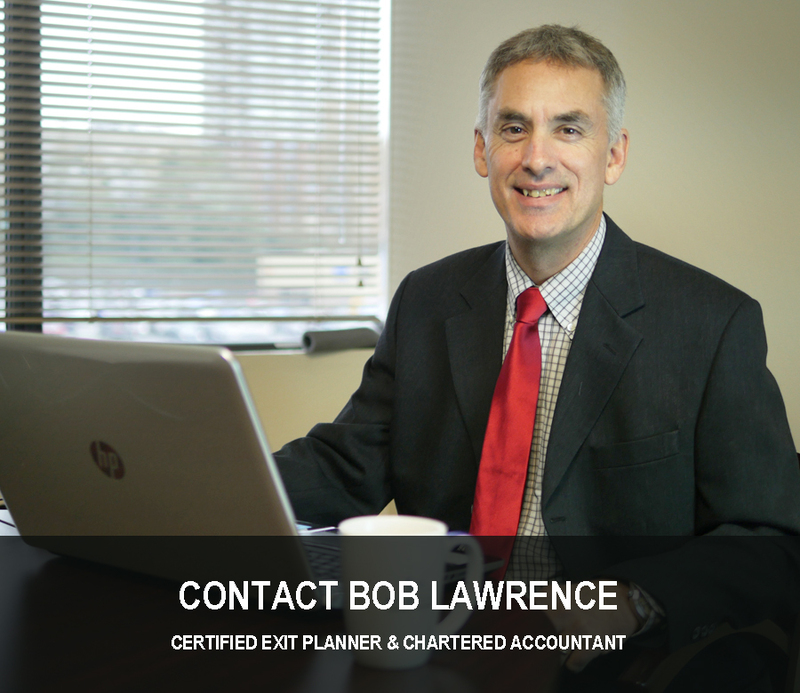 Having worked with dozens of businesses in transition, Bob has earned the notable designation as the the first Certified Exit Planning Advisor (CEPA) in British Columbia. He leverages his technical training with many years of practical senior management experience to lead our Consulting and Business Advisory services. "I have had the opportunity to work with Bob on solving many business related problems. I found his energy, enthusiasm, and business acumen to be second to none. He is a trusted mentor and business advisor." "Bob is one of the first people I call when I have a business or organizational challenge. He is knowledgeable and trustworthy, and easy to talk to. I recommend Bob as an advisor for any business looking to become more successful." "Bob was hired to manage our primary supplier. In short order, he was able to develop a strong rapport, communicate effectively, and understand our business dynamics to allow our companies to work well together. " − Pat Alexander President Long Life Windows and Doors Ltd.